Ages 4 through 12. The Screening Test for Developmental Apraxia of Speech - Second Edition (STDAS­2) is now completely revised and updated to incorporate reviewers' suggestions for improving the instrument. The STDAS­2 identifies children ages 4 through 12 who have both atypical speech-&-language problems and associated oral performance. These two key factors render children suspect for developmental apraxia of speech. 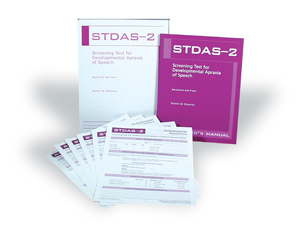 The STDAS­2 has four subtests. The first subtest, Expressive Language Discrepancy, is a required prescreening task. For this subtest, the difference between expressive and receptive language age is calculated if receptive language age is higher than expressive language age. This discrepancy remains the best indicator for further testing of developmental apraxia of speech. The other three subtests, Prosody, Verbal Sequencing, and Articulation, are core subtests. The STDAS­2's reliabilities range from .75 to .96. Several new validity studies were conducted. One validity study examined STDAS­2 subtest scores on the Verbal Sequencing and Articulation subtests for three groups: children suspected of having developmental apraxia, children with other language impairments, and children with normal speech. The higher the score for both these subtests, the greater the probability of having apraxia of speech. For both subtests, children suspected of having developmental apraxia of speech scored higher than children in the other two groups. The test provides the examiner with the probability of a child having developmental apraxia of speech based on the age of the child and scores on the three core subtests. The complete kit includes the Examiner's manual and 50 Profile/Examiner Record Forms in a sturdy storage box.